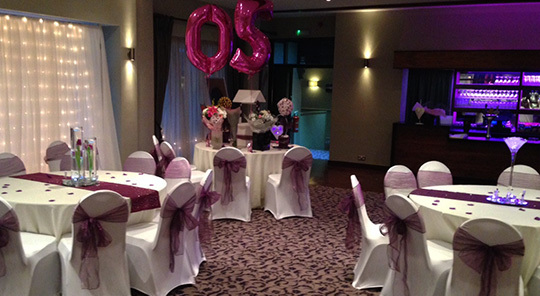 ABC Marquees were delighted to be involved in the planning and decoration of Mrs. C’s 50th birthday party, held in the function room of Wickwoods Country Club, Hotel & Spa in Sussex. Approximately 50 guests attended the party in January, where sparkle and glitz adorned every available space! Additional furniture, furnishings and decorations are all available from ABC Marquees, with marquee hire, linings and party planning services as required. Find out more about our Party Planning and Marquee Accessories for hire.